Celtic would top last season's unbeaten clean sweep if they record a second successive domestic treble, according to former manager Gordon Strachan. Strachan believes that improvements made by other teams have made it a more difficult task this time round. "It's been harder for Celtic this year," said the man who won three titles as manager of the Glasgow club. "Neil Lennon's made Hibs a better side, Rangers are better this year and those two have made the league harder." Brendan Rodgers won the League Cup, Premiership title and Scottish Cup to earn the "Invincibles" moniker in his first season as Celtic manager. The Northern Irishman's side retained the League Cup this season, are one win away from a seventh consecutive league title and face Glasgow rivals Rangers in Sunday's William Hill Scottish Cup semi-final at Hampden Park. But Hearts ended their record-breaking 69-match unbeaten run with December's stunning 4-0 Tynecastle triumph, while Steve Clarke's rejuvenated Kilmarnock also upset the champions in February. 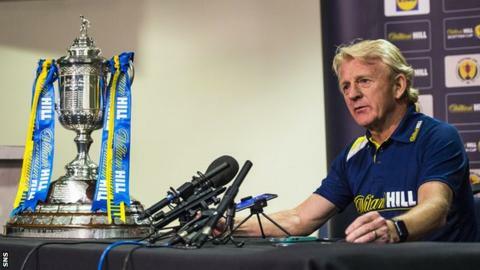 And Strachan says - on the whole - his old side have had much more to contend with this season, especially with main strikers Moussa Dembele and Leigh Griffiths both having struggled with injury. "Obviously you only need to look at Hearts too when they beat Celtic 4-0 under Craig Levein, so the standard of the teams have made life a bit harder for Celtic and have pushed them a bit more," he added. "They had so many players at top form last year, but now you look at the big fella up front, Dembele, and Griff - they've both been injured at times this season. "So, putting that all together, it would be a fantastic achievement if Celtic get the treble again as they've definitely been put under more pressure this year."